Trench coats are the epitome of Spring. With an array of colours, they have the power to take your outfit up a notch, making even the simplest of outfits, effortlessly chic. The classic trench coat has been around for over one hundred years! It was used by military because of its durable material that could withstand the elements (wind, rain, etc). Today, we use them not only for their function, but also for the way they can perfectly tie together an entire outfit, leaving you looking polished and timeless. 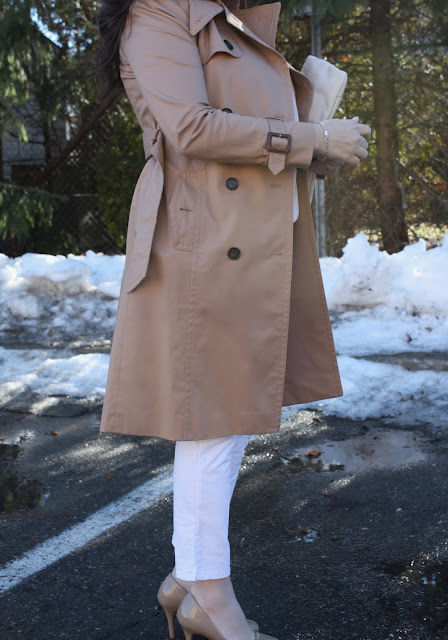 In this post, I want to review two trench coats, both in the classic ten-button style. One of my favourite things about the trench coat is all of the many ways that it can be worn. Each style giving your outfit a different look altogether. To achieve this, try rolling up the sleeves, popping the collar up or tying the belt towards the back. Buttoning up the trench coat will also protect your outfit from getting wet should you get caught in a Spring downpour. The first trench coat is from Ann Taylor and it is in a camel colour. It is a thicker material and therefore wrinkles much less. I love the interior lining that they have put on this one because it counters the khaki, it is a soft coral. When closed, it's a beautiful slim fit and does not add much bulk despite of it being a heavier material. For reference, I bought this trench coat in a xs petite. I found that the sleeve length was perfect and wouldn't need altering. This exact model and colour is no longer available at Ann Taylor but the 'modern trench' is and is currently on sale (colour: 'paradise orange'). You can find that one here. That beautiful bright colour will definitely make a statement on those grey, cloudy days! The second trench that I wanted to share is from Banana Republic. I have a couple of khaki coloured trench coats and wanted to get one in black. What sold me on this particular one was the beautiful yet subtle A line shape that it has when it is buttoned up. It's perfect to wear over fuller skirts as they will not be crushed and will simply mimic its shape. Another selling point for me on this particular trench was the animal print lining. If you follow me on Instagram, you would have seen that I don't wear animal prints so I found this a good way of dipping my toes into this trend without going all out. The animal print lining is no longer available but the classic black trench is and you can find it here. If you are building your wardrobe and you are focusing on the staples, I definitely recommend that you invest in a good trench coat - it will last you years and because it's a classic, it will always be in style. Welcome to Petite in Blush!